Hide and Seek by Ian Rankin and meeting the man himself! 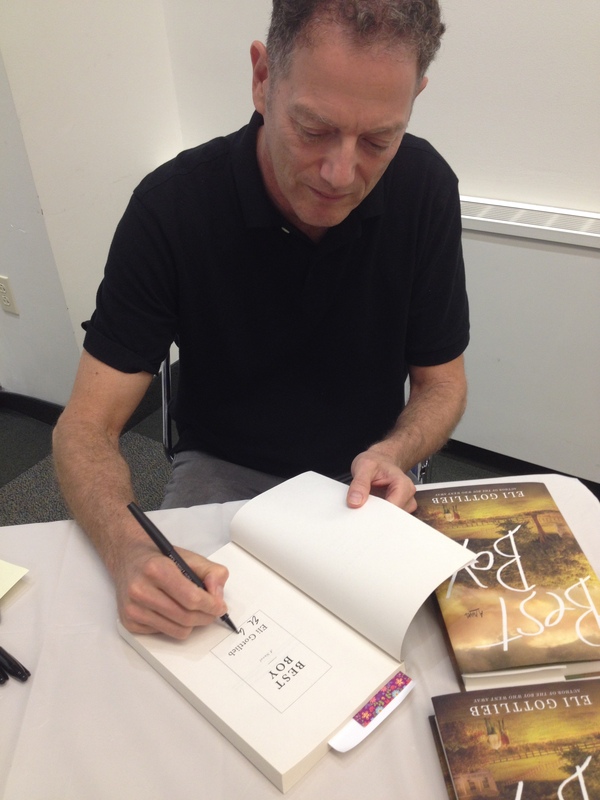 Last month Ian Rankin came to town and on a cold, snowy night and he had a packed house with fans that came from as far as Pennsylvania and New York. I must again give a shout out to our library system, who always brings in the big names (this month I’m seeing Harlan Coben and next month Stephanie Evanovich and Heather Morris). Anyway, I loved Ian’s first Rebus book and really wanted to spend an evening with a legit Scottish accent. So my mom and I went (he is signing her book here). He was delightful. He spoke for about an hour and took a lot of questions, some very serious ones about current affairs, like Brexit, and managed to educate and entertain. So, Inspector Rebus is back. I looked back at my thoughts on the first book and saw that I was concerned about how much alcohol everyone drank. Well, I’m happy to say that Rebus, at least, was a bit more restrained. It’s a year later and he has no contact with his family and his girlfriend is gone and he seems…okay? He gets an invite to the big boys club and he takes it, if a little unwillingly. He needs to sign off on an overdose and move on to a more cushy job, but he just can’t let it go. When we met Ian I mentioned how much my mom enjoys dead bodies and he said that his series had a low body count. That may be true later in the series (it’s over 20 now) but this one seemed to have its fair share of corpses. All well deserved in my opinion. As with the first book I love the Edinburgh setting and the often surly Inspector Rebus. The plot will keep you reading, I promise. I can’t wait to continue with this series. And if you get a chance to hear Rankin speak, take it! Mary Bly, the daughter of an award-winning poet and short story writer, spent her childhood writing plays that she and her siblings acted out for their parents. There wasn’t a television in the house, but there were books, lots of books. She great up, went to Harvard, became a professor teaching about Shakespeare at Fordham University in New York, and then started writing historical romances. I’ve read a few of her books and really liked them and I was happy to make the 30 minute drive to hear her speak. 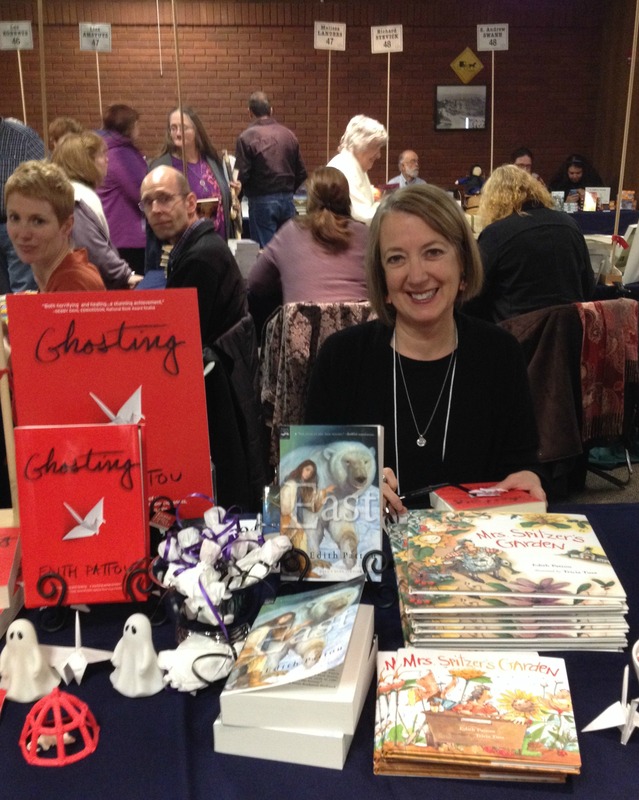 Some authors at these events speak for a few minutes and then hope for questions. 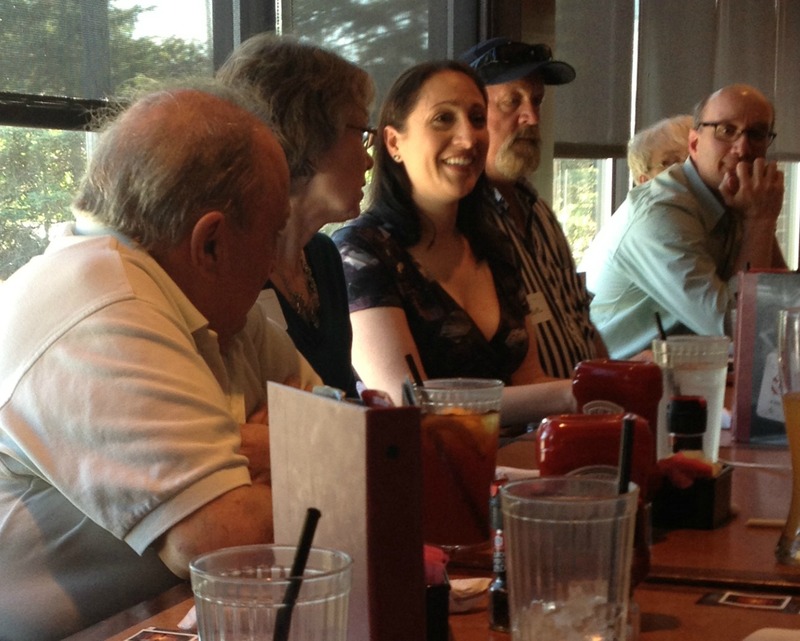 Mary spoke for over 30 minutes and then spent another 30 answering questions, including how her husband proposed. She was so comfortable, from her years as a professor no doubt. She talked about her book, How Beauty Tamed the Beast, and how the Beast was based on Dr. House from the House MD TV show. She read through seven years of scripts so that she could get him just right. As a fan of House I bought the book that night and am halfway through. She has made House into a romantic hero, no doubt. According to her website– Kindle, Nook, Google Play and Kindle CA. are all offering the book for 99 cents just for today. Buy it! Also on her site is a clip of her when she came to speak. It was on the local news and there are glimpses of me. I’m famous! She gave us beautiful recipe cards from the time periods of her books and I have a set to give away. If you like to cook or are an Eloisa James fan leave a comment and I’ll send them your way. Don’t you just love her shoes? 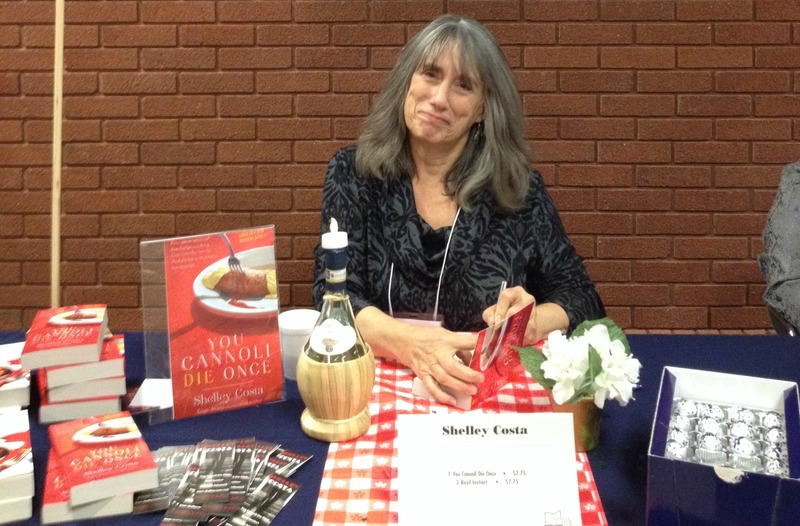 I’ve always tried to attend author signings in the area but timing is a struggle. I decided to make more of an effort because I always enjoy them and I like to support the local book scene (yes, Cleveland has a book scene ;)). 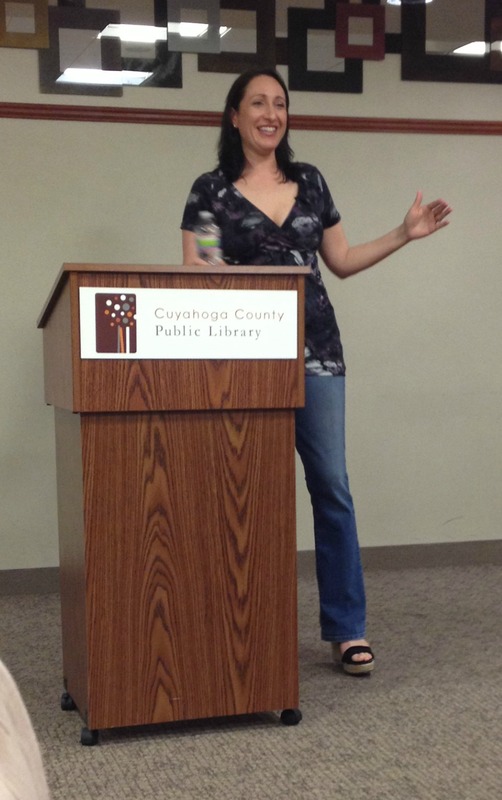 The Cuyahoga Public Library system is so good at bringing authors in to the libraries and last week I visited a branch 15 minutes away because I needed the time to myself (I could make up a better reason but honesty is okay here, right?) AND the local mystery-thriller looked just up my alley. I haven’t read The Dead Key BUT D.M. 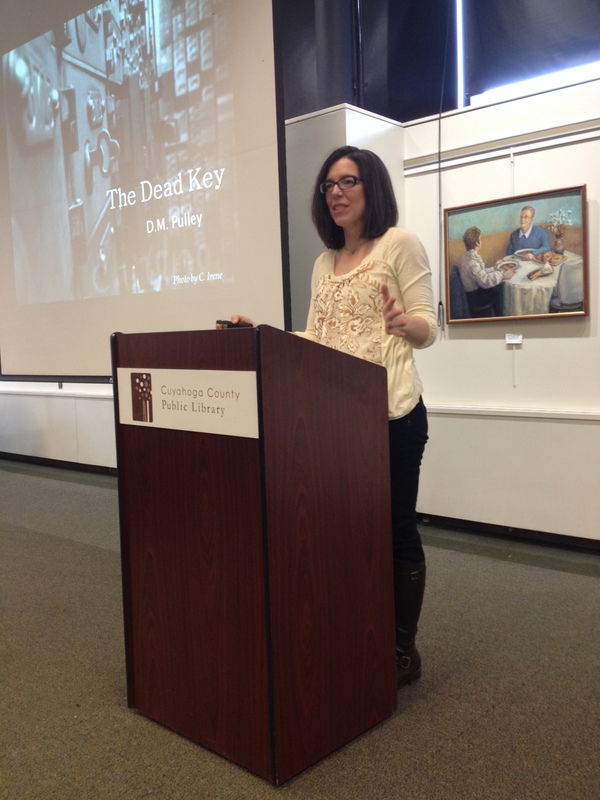 Pulley (pen name) was so delightful at her first author talk that I am really looking forward to starting the book. I’m not sure how many people were there. When I sat down there were maybe 35 but who knows how many filtered in after that. She was so outgoing, well-spoken, and prepared that the audience was charmed. I heard more that one attendee say that it way the best author talk they had attended. Hm, a few highlights? *She beat out 10,000 other writers for the top Amazon Breakthrough Novel Award. The book took 8 months to write and almost 4 years to edit. She was at her uncle’s funeral when she found out she had won, surrounded by family. 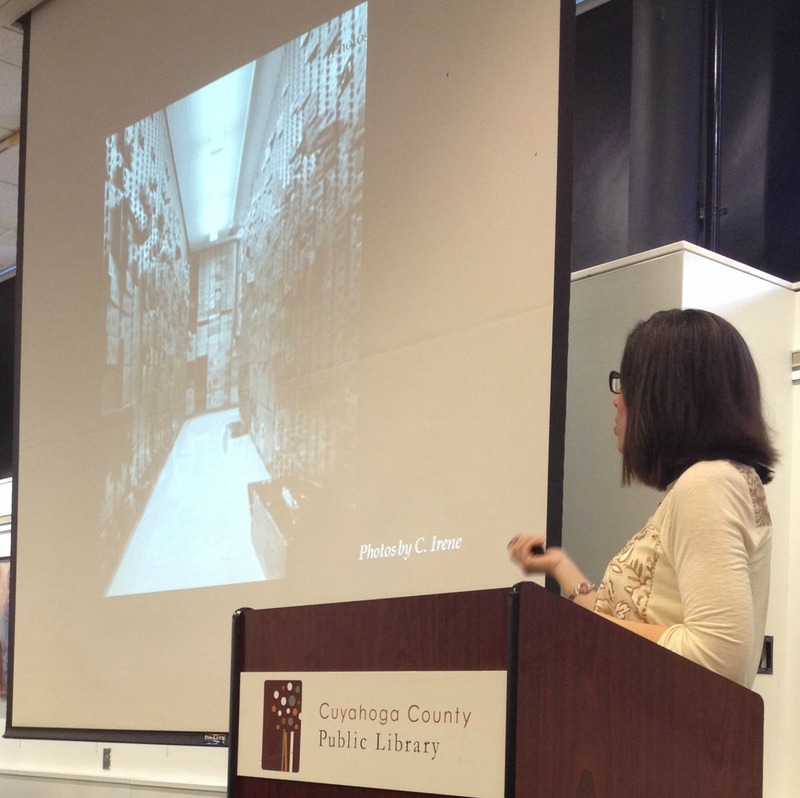 *She then went into forensic engineering, historical preservation. 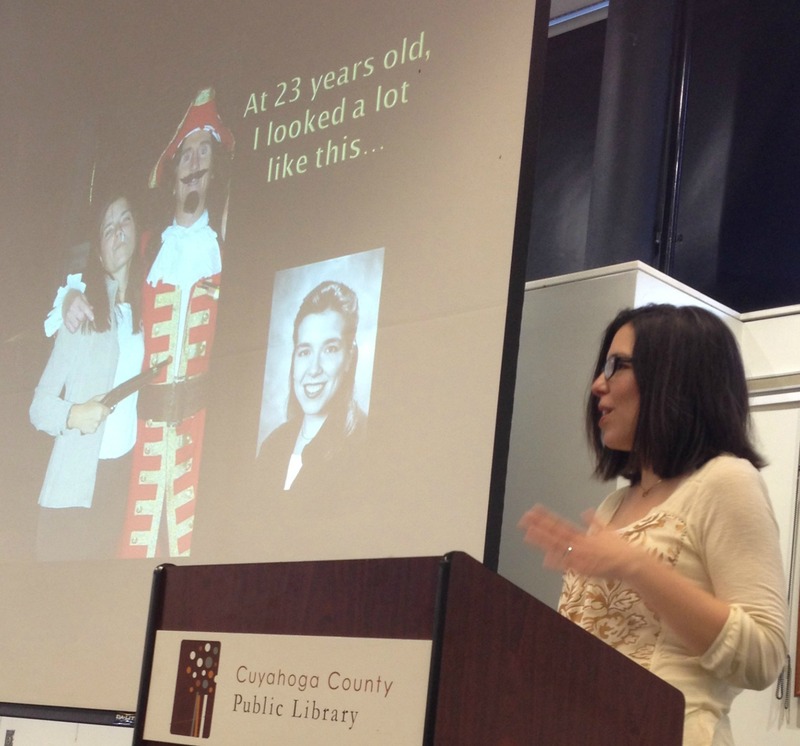 She showed some photos of her hanging from the highest buildings in Cleveland and I was impressed and frightened. My fear of high open spaces made me antsy just seeing them on-screen. She’s a gutsy woman with a very cool job. *The book is based on her experience at an abandoned bank in downtown Cleveland. When she got to see the basement vault in 2001 there were safety deposit boxes, both hanging open and locked shut, and this was the spark that led her to write the book after having her second child. *After she won the Amazon contest she was contacted by a local photographer who had taked pictures of the vault before renovation. One of those pictures was used for the cover and another is the one that Pulley said looked like what had been living in her mind all those years. A story waiting to be told. *You can see pictures and more about the idea for the book here and see a short interview with her on the local news here. I am really looking forward to reading the book and would highly recommend seeing her in person if you can. She’s smart woman who appreciates the opportunity she’s been given. Her local appearances are here but here’s the NPR link if you can’t make it to one. So, has anyone read it yet? 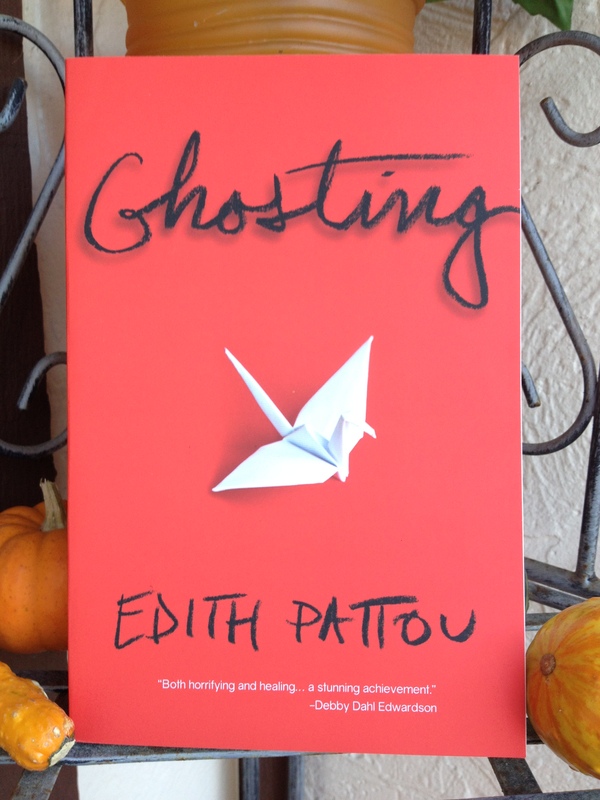 Mailbox Monday – November 3- with a giveaway! Nothing arrived via mailbox this week but on Saturday I attended the 27th annual Buckeye Book Fair. It was an hour drive but I considered it a personal date and enjoyed my excursion without pickups or meal planning or swim lessons for the little man. It was bit overwhelming at first because it was so crowded, but then I took a deep breath and dove right in. There were many well-known authors and lots I’d never heard of. It was tough talking to an author and looking at their books and then deciding not to purchase, but I could only justify so many books!! 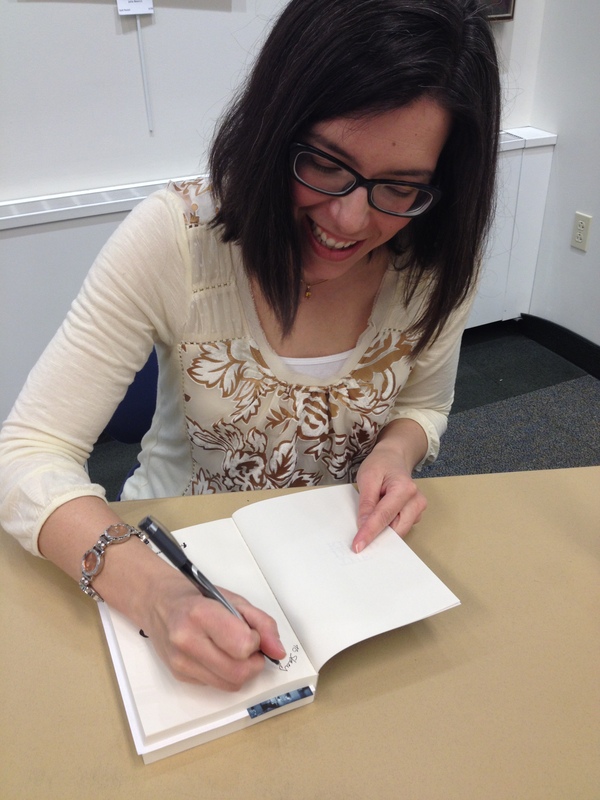 Read or skip to the end to see what signed book I’m giving away! I was really there thanks to author Emilie Richards since she mentioned it on Facebook last week and so I made sure to find her. She was so nice in person, even insisting on a photo with the two of us. I’m a fan and am working my way through her books. 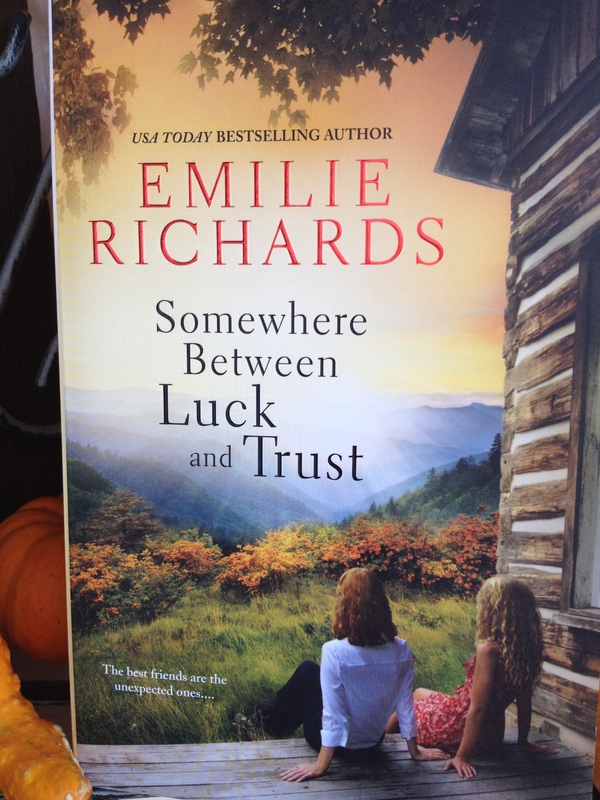 I purchased Somewhere Between Luck and Trust, the second in the Goddesses Anonymous series. Cristy Haviland served eight months in prison, giving birth behind bars to the child of the man who put her there and might yet destroy her. Now she’s free again, but what does that mean? As smart as she is, a learning disability has kept her from learning to read. And that’s the least of her hurdles. I stopped to chat with Shelley Costa because I had seen this title around and I wanted to tell her how clever I thought it was. 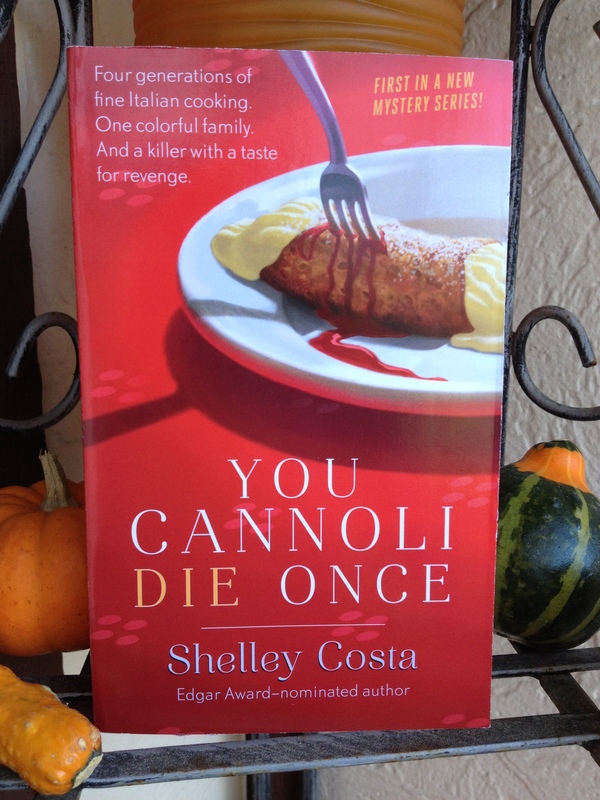 We chatted few minutes and I learned that she lives in the next town (where I would love to live if we ever moved again) so I had to buy it, the first in a series, You Cannoli Die Once. My next two purchases were by authors I didn’t know but something about the books made me want to give them a try. 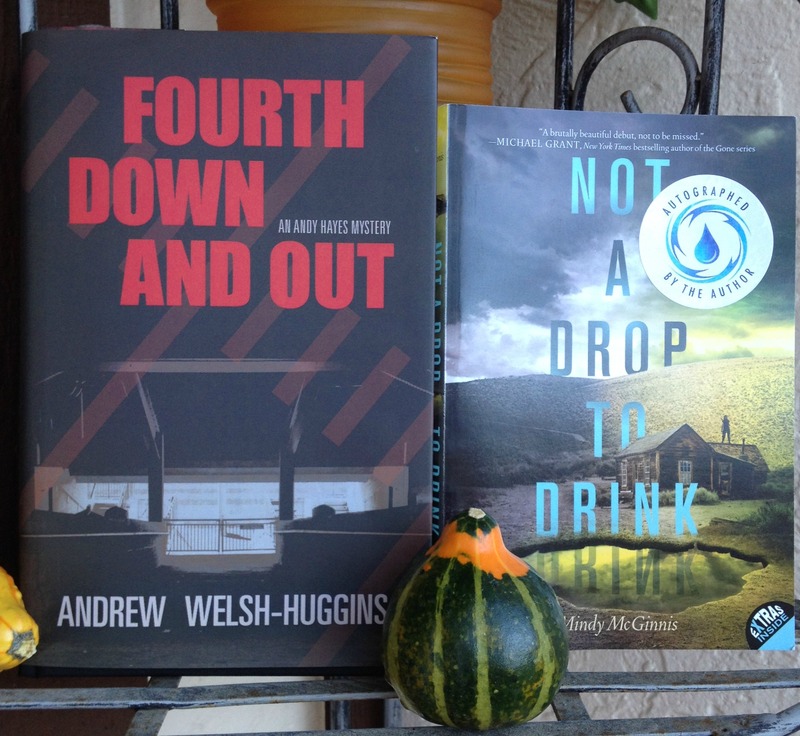 Fourth Down and Out by Andrew Welsh-Huggins is about a disgraced Ohio State quarterback who lives in Columbus and since this is football season I had to have it. The second is what happens to us as the world runs out of water. Soon, there’s a growing list of people with a claim on the computer, all of them with secrets they don’t want uncovered. When one of those people ends up dead, Andy has his hands full convincing authorities he’s not responsible, while trying to figure out who is—and who’s got the laptop—before someone else dies. Soon the trail leads to the last place Andy wants to go: back to Ohio State University, where few have forgiven him for a mistake he made two decades earlier in his days as the Buckeyes’ star quarterback. That misjudgment sent him on a downward spiral that cost him a playing career, two marriages, several wrecked relationships, and above all his legacy in Ohio’s capital city, where the fortunes of the OSU team are never far from people’s minds. Eggs come in many colors, shapes, and sizes. Some eggs are hard. Other eggs are soft. Can you match each egg to its owner? 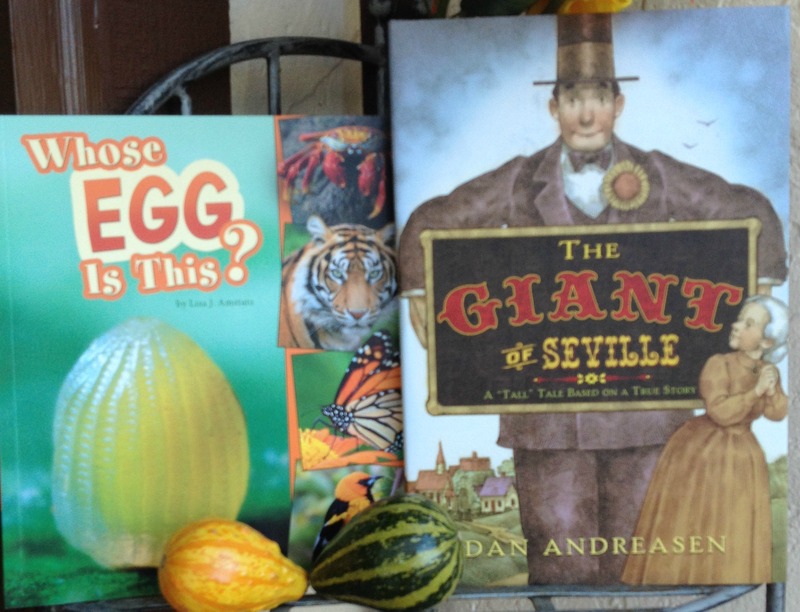 Fun clues and multiple choice photos will have you puzzling to learn more! I picked up a book signed by Thrity Umrigar to give away. I’ve heard her speak and have several of her books already so I wanted to give you the chance to experience a respected Ohio author for free. She lives up in the Cleveland area just like me! This is not a new book but I chose it because I think most of you will like it. 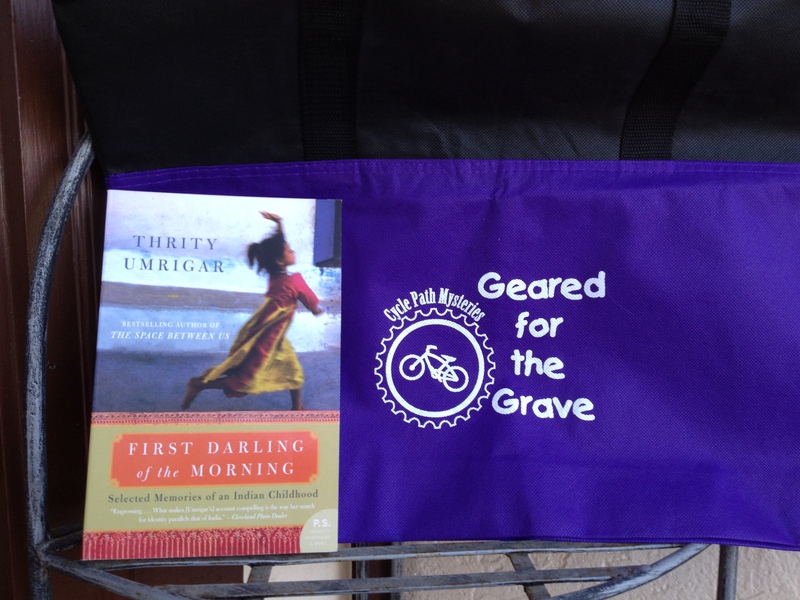 In addition, author Duffy Brown graciously contributed a great canvas bag highlighting her new series set on Mackinac Island, Geared for the Grave. I’ll draw a winner on November 25 so I can get it mailed before Thanksgiving. It would make great Christmas gift for yourself or someone else 🙂 Open internationally. Wanna win? Just tell me so in your comment and leave an email address. Good luck! Over the last 13 years I have grown fond of living in the Cleveland area. We have a great lake, we have an outstanding park system, our suburban schools are excellent, the cost of living can’t be beat, we have the best medical hospitals at our beck and call…I could go on and on. But one thing we don’t have an abundance of is bestselling authors popping in on tour. I was lucky to see Beth Hoffman a few weeks ago and tonight I had to make a choice between bestselling authors. Can you believe it? Janet Evanovich and Taylor Stevens were speaking half an hour apart and as much as I tried to make the math problem work I knew I’d have to choose. Taylor made it easy for me by inviting those on her email list to join her at TGIFridays from 5-6:30 before going to the library to speak from 7-8:30. 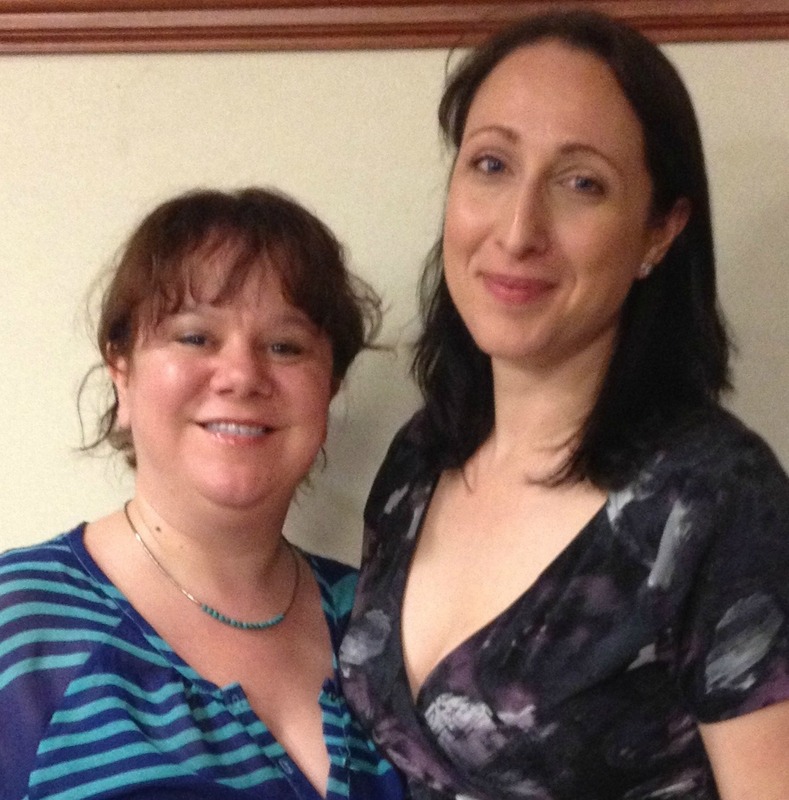 This was my second time meeting Taylor, the first time at Bouchercon last October, but this time I got to hear her speak so I was able to learn more about her growing up all over the world in a cult. If you want to learn more that life you can read the second book in the series (The Innocent), a book Taylor calls a thrillerized version of her life. “If it’s in that book, it happened, yes.” I admit that I still have to read this one, but it has moved to the top of my list. Here are a few pics from the evening. If you get a chance to see Taylor speak you should take advantage of it. She is so open and really enjoys talking to people and sharing her experience with you. If you don’t have to opportunity to see her in person you should sign up for her email list. She shares publishing secrets and gives a lot of insight into how the industry operates. Sign up for her email list here. I had a fantastic evening and am so happy that I chose Taylor over Janet 🙂 I’ve got a signed copy of her latest, The Doll, ready to give away soon! 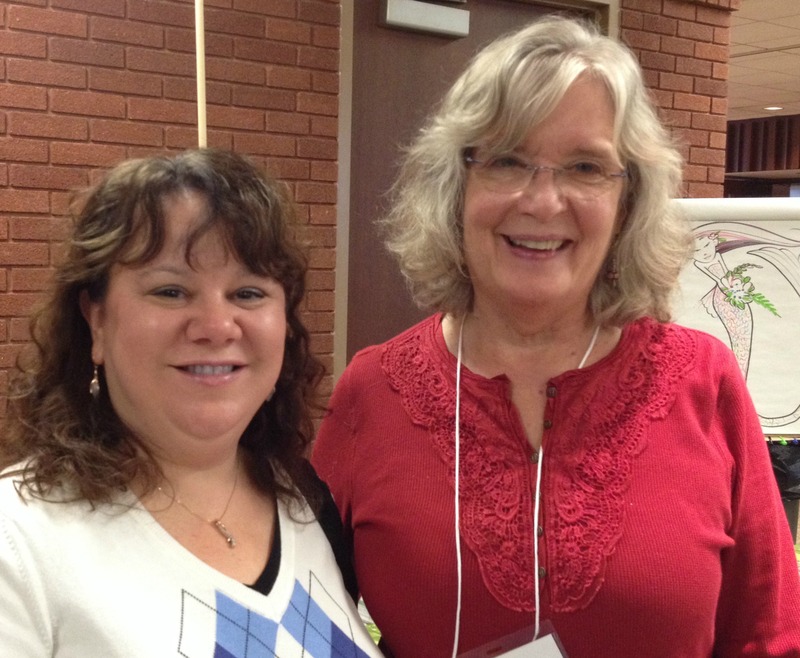 Seeing Beth Hoffman, best author hugger ever. 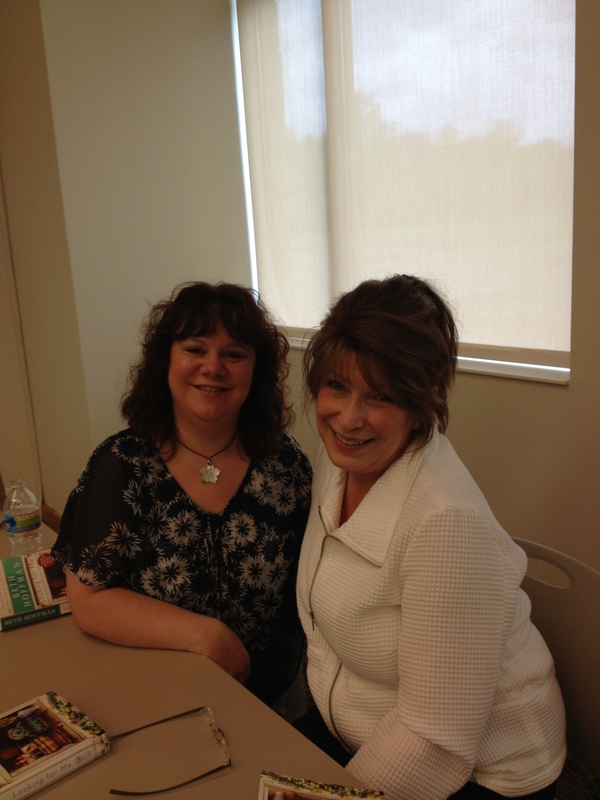 I had the pleasure of spending some time on Saturday afternoon with the beautiful bestselling author Beth Hoffman. I met Beth when she came through northeast Ohio (her old stomping grounds) on the Saving Cee Cee Honeycutt tour a few years ago and was charmed by her warmth and spirit. On Saturday she was just as inspiring. Beth told the story of how very close to dying she came and how she knew that something had to change. Cee Cee was born. 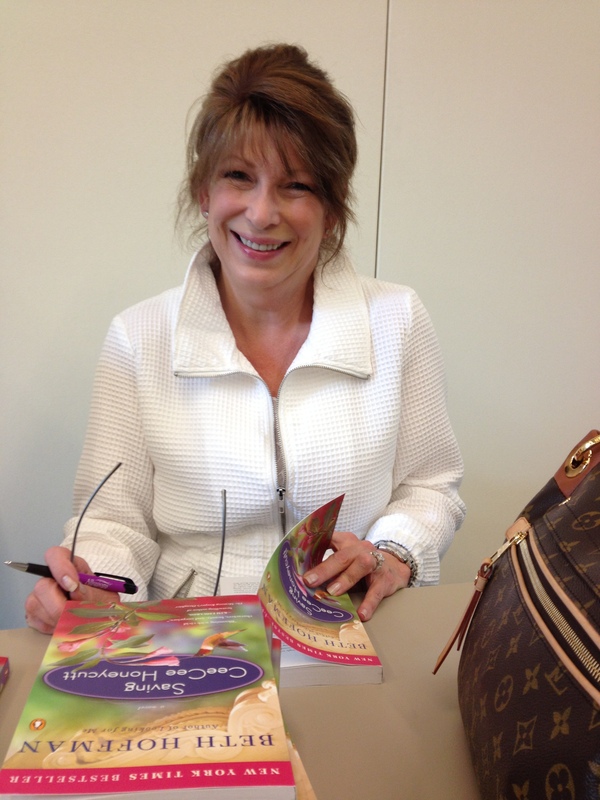 Like most who read it, I loved Cee Cee and Beth became a bestselling author. Her latest book, Looking for Me, was a much more personal one for her. She considers Cee Cee her heart, but Teddi’s story her legacy. I think part of her legacy may also be how genuinely appreciative she is of her readers, and how great her hugs are 🙂 So if you ever get the chance to hear her speak, do it!! I was also able to meet Bonnie from Redlady’s Reading Room (we were the first ones there) and we were able to catch up after the signing. Considering that we live about 20 minutes apart we don’t see enough of each other. I didn’t get a picture of the three of us like I did at the last book signing, but you can hop over to Bonnie’s to see her picture with Beth. I did get an extra copy of Looking for Me signed by Beth and will be giving it away at a later date.